A rechargeable plastic card fitted with a microchip that will eventually replace paper Travelcards went on sale on Monday. London mayor Ken Livingstone hopes the new Oyster card, which can be used on the Tube, trams and buses, will cut ticket fraud and Monday morning queues. Customers will eventually be able to "top up" their cards over the phone, the internet or at ticket offices and machines. Mr Livingstone said: "The smartcards will reduce queues at stations, allowing people to move more quickly through Tube ticket gates and are much more secure than paper tickets." 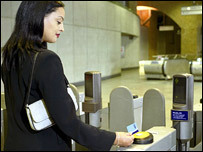 Initially the Oyster card will only be available to monthly and annual Travelcard holders over the phone or the internet. But by the end of summer, bus pass holders will be able to buy them and they will go on sale at ticket offices and shops. 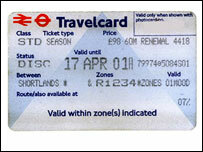 Weekly Travelcard users and Freedom Pass holders will also be able to use the cards. The cards will also allow travel mainline trains within zone six only. By next spring 350,000 people are expected to have switched to the new system. The £1bn system has been developed by private consortium TranSys which says its potential is huge. The card can be personalised so details will be stored if it is lost or stolen. It is thought that the microchip is so sensitive, it will register even if scanned while still inside bags or purses. Eventually the chip could be installed in mobile phones or watches or used to buy other items at stations such as a coffee and a newspaper.